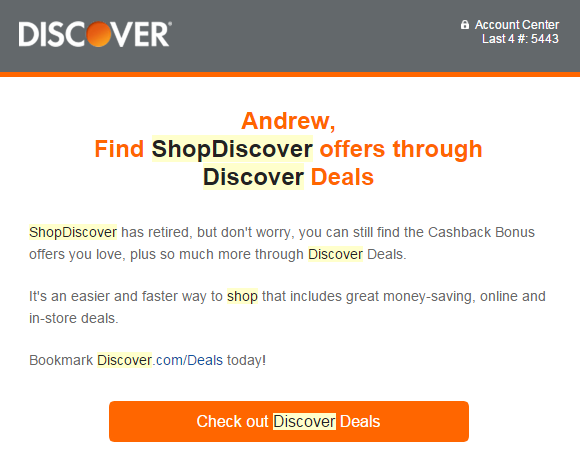 I recently received an email from Discover saying that ShopDiscover was retired and the new name is Discover Deals. Why Was The ShopDiscover Name Changed To Discover Deals? My conclusions are purely speculation since I neither work at Discover nor do I have a contact to tell me the impetus of the change. 1. The word Deals is more likely to garner traffic likely to signup for a Discover card. Note, they went with 2 words this time. Discover hosts a huge authority website that is more likely to rank for Deal related searches and than Shop related searches. Over 90,000 people search for simply the word deals each month. Google considers competition for this term low. 2. Deals more accurately describes what Discover is offering. ShopDiscover implies Discover is selling you an item. The reality is they didn’t even highlight specific items. It was purely a cashback focused website that used affiliate links to give Discover customers a kickback on their purchases from merchants. 3. 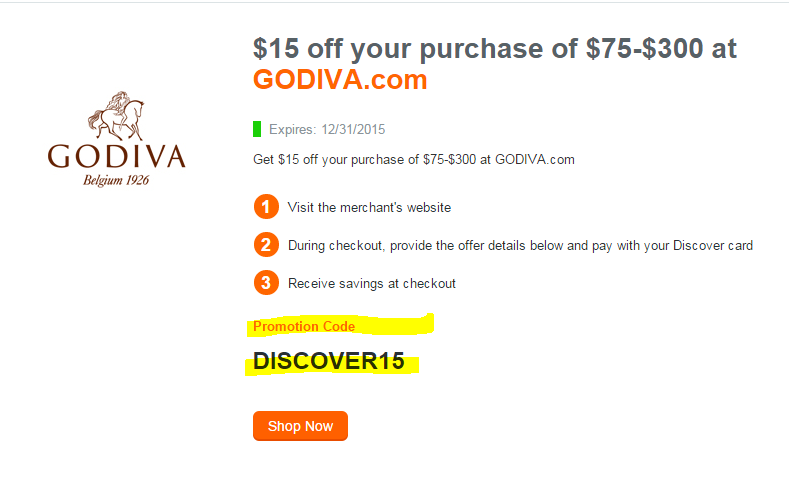 Discover Deals is going to integrate more coupons. They are targeting the RMN / Groupon models. Discover is light years ahead of the other banks on this front. I fully expect product specific deals to also be posted on the new site. This would allow them to target the Slickdeals / Fatwallet model. I am already starting to see coupons integrated on the new site. 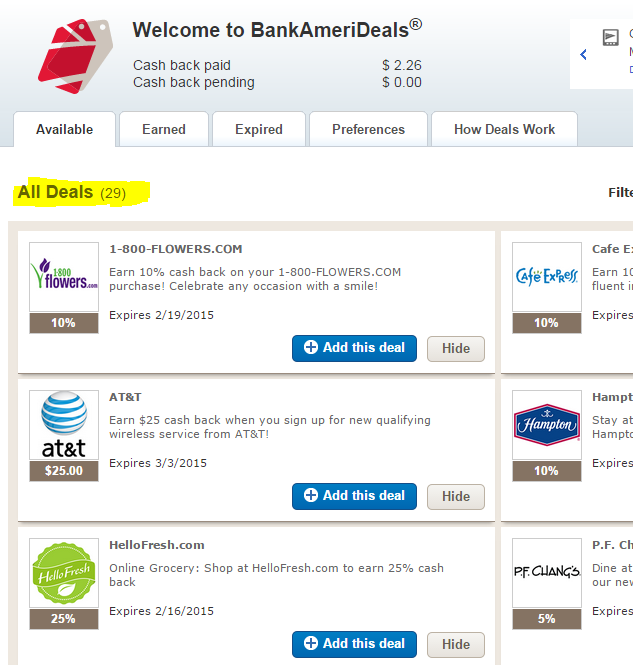 How Does Discover Deals Differ From What Other Banks Are Offering? Other banks offer attempts that are half-hearted at best. Bank of America uses a system that lets users add discounts to their credit card. The merchant list is incredibly limited and not consistent. BOA currently has 29 offers compared to well over 200 offers with Discover Deals. The Chase system is awful. It has roughly the same number of stores as Discover Deals. I believe they use to outsource their system almost entirely. The newer system looks better, but Discover is steal better because the cashback starts at 5% and goes in increments of 5. The Chase system shows a deal for Newegg at 2%, but that includes 1% that I would normally receive by using my card anyway. Some people at Fatwallet are claiming the new Discover Deals interface might not rely upon merchant affiliate reporting and instead matching an activated deal with a credit card statement (like BOA uses). This would be a radical change if true. 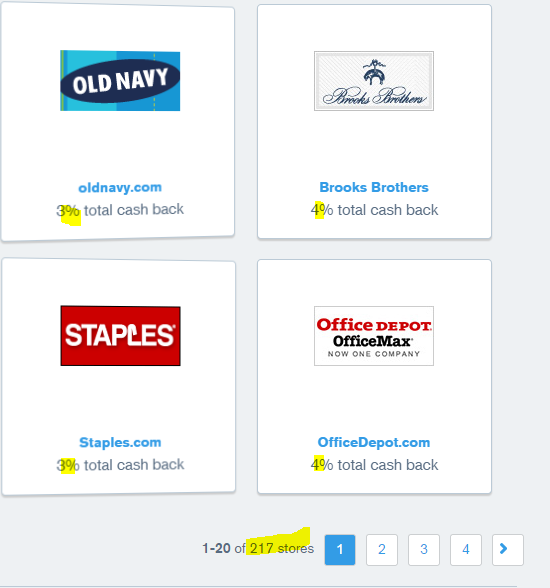 I used Shop Discover all the time with my Visa that gives me 2.5% cashback on all purchases. I’ll update again after I make more purchases and get a better idea as to whether the system actually changed in this manner.